During the forecast period of 2017 to 2022, the demand in the global smart toys market is expected to increment at a considerable CAGR, gaining traction from a number of factors such as advancements in artificial intelligence (AI) and the Internet of Things (IoT), changing lifestyle of urban population who have increased their disposable income but losing on time for parenting, and growing awareness regarding the benefits offered by these modern toys, both outdoor and indoor. Though the high cost of these products continues to challenge the prosperity of the global smart toys market, the vendors of this market are depending on innovation to expand their horizons. Based on the type of toy, the global smart toys market has been segmented into app-enabled mechanical toys, screenless toys, voice or image recognition toys, toys-to-life, health-tracking toys or wearables, puzzles and building games, and others. In 2017, voice of image recognition toys served 31.1% of the overall demand, which was valued at US$2,271.7 mn. The demand for this segment has been projected to experience a CAGR of 3.7% during the forecast period of 2017 to 2022, reaching a global worth of US$2,720.4 mn by 2022. The voice or image recognition smart toys segment is growing at US$89.7 mn annually over the course of the forecast period, and this absolute growth is larger than any other segment. Based on interfacing device, the market for smart toys has been bifurcated into smartphones, tablets, consoles, and drones, whereas on the basis of wireless communications technology, the market has been categorized into Wi-Fi, Bluetooth, RFID or NFC, and others. Geographically, the report evaluates the potential of smart toys market in North America, Europe, Latin America, Asia Pacific except Japan (APEJ), the Middle East and Africa (MEA), and Japan. In 2017, North America smart toys market was worth US$1,802.0 mn in 2017, and expanding at a CAGR of 3.3% during the forecast period of 2017 to 2022, the valuation is estimated to reach US$2,119.2 mn by 2022. High adoptability rate of new technology and substantial buying ability of the citizens of developed countries such as the U.S. and Canada are two primary factors aiding to the North America soft toys market. On the other hand, Europe constituted 23.9% of the overall demand in 2017, the second most prominent chunk of regional demand in the global smart toys market. However, Asia Pacific except Japan is projected to experience an above-average CAGR of 3.9%, the best among all regions. APEJ makes for a vastly population region, which includes a high percentage of children between the age of five to 14. In countries such as India and China, disposable income is increasing among the urban populations and the pool of prospected customers is escalating. The overall revenue in the APEJ smart toys market is estimated to reach a net worth of US$1,619.6 mn by 2022. Japan smart toys market is expected to create absolute dollar opportunities of US$56.1 mn between 2017 and 2022. Fisher-Price Inc., Activision Blizzard Inc., The Hasbro Inc., Genesis Toy Co. Ltd, Spin Master Corp, Seebo Interactive Ltd, LeapFrog Enterprises, Inc., Wow Wee Group Ltd, Reach Robotics Ltd, and SmartGurlz ApS are some of the key companies currently holding a prominent position in the global smart toys market. Most of these players are investing heavily on research and development activities, as new and niche products helps them garner more sales. Though the market is currently in nascent stage, advancements in the field of IoT and AI are expected to open up endless potential for content in this market. Smart toys makes for a market in its nascent stage, wherein the development of niche products, especially due to the emerging possibilities with the Internet of Things (IoT) and artificial intelligence (AI), is opening vast new opportunities. Recognizing the strong potential for the future, this report on the global smart toys market has been compiled by a group of professional market research analysts, highlighting and analyzing the micro and macro aspects and providing a thorough study to its targeted audiences. This report on the global smart toys market analyzes the current and future prospects of the market. The report consists of an elaborate executive summary that includes a market snapshot, providing overall information of various segments and sub-segments. This research is a collaboration of two parts, primary and secondary research. While the primary research constructed a major chunk of our research efforts. It included collection of information from telephonic interviews and conversations via e-mails with industry experts and opinion leaders. On the other hand, secondary research essentially focused on studying company annual reports and their official websites, recent press releases, and stock analysis presentations. Our analysts also dug through various international and national databases to extract quantitative and qualitative data. This report on the global smart toys market offers market size in terms of US$ mn for each product, device, wireless communications technology, and geography segment and sub-segment for the period from 2017 to 2022, considering the micro and macro environmental factors. 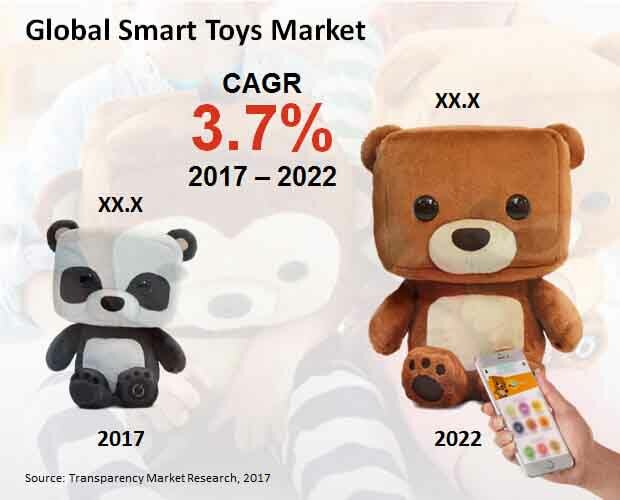 Growth rates for each segment within the global smart toys market have been determined only after a thorough assessment of past trends, future trends, demographics, technological developments, and regulatory requirements. The market dynamics sections reveals a detailed qualitative analysis of factors that are expected to favor or obstruct the market growth and future opportunities has been provided in the market overview section. This section of the report also comprises market attractiveness analysis, aiming to provide an elaborate analysis of the overall competitive scenario in the global smart toys market. On the basis of the type of toy, this report segments the global smart toys market into app-enabled mechanical toys, voice or image recognition toys, screenless toys, toys-to-life, puzzles and building games, health-tracking toys or wearables, and others. Based on interfacing device, the market for smart toys has been classified into tablets, smartphones, consoles, and drones, whereas on the basis of wireless communications technology, the market has been categorized into Bluetooth, Wi-Fi, RFID or NFC, and others. Geographically, the report takes stock of the potential of smart toys market in the regions of North America (U.S. and Canada), Europe (Germany, France, U.K., Italy, Spain, and Nordic), Asia Pacific except Japan (India, China, Thailand, Malaysia, Singapore, and Australia), the Middle East and Africa (GCC countries, South Africa, Israel, and Nigeria), and in the country of Japan. For each of these regions and country, the report provides revenue comparison based on toy type, interfacing device, and wireless communications technology. Genesis Toy Co. Ltd, Activision Blizzard Inc., the Hasbro Inc., Fisher-Price Inc., LeapFrog Enterprises, Inc., Spin Master Corp, Reach Robotics Ltd, Seebo Interactive Ltd, Wow Wee Group Ltd, and SmartGurlz ApS are some of the key companies in the global smart toys market that have been profiled in this report. For each individual company, the report provides business overview, product type, toy type sales data and key financials, recent strategic developments, and SWOT analysis. The competitive landscape of the report also contains a dedicated section on company share analysis by region.